Need a guest room? Get a Murphy Bed! When downsizing, it is highly likely that you may give up that guest room. You know the room in your house that always looks lovely but is only occupied a couple of times a year. We deem them necessary but giving up that much square footage for a space that is rarely used, hardly makes sense. 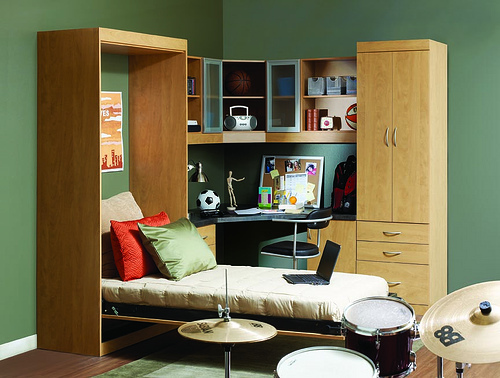 So…have you considered a Murphy Bed as an option? Pretty cool huh? My favorites so far have been seen on WallBedFactory.com. Go check them out! Don’t let needing a guest room hold you back from downsizing your life! Images via 1. 2. 3. 4. 5. Love Murphy beds! Who in Oregon builds them? I think my old beach house could use several. Then each bedroom could be separate hangouts for my variety of weekend guests and grandkids. 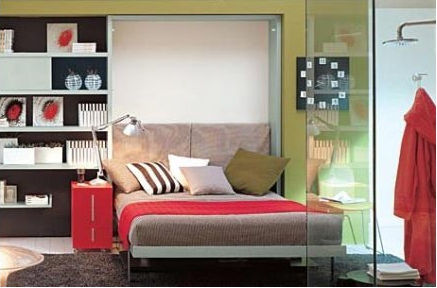 We would love to put a Murphy bed in our Den. Do you have a good contact for someone to buy one from? Thanks for your help. Hi Karen. Thanks so much for visiting my blog and leaving a comment. Actually there are two good contacts her in Oregon for Murphy Beds. The first one is http://www.wallbedsoforegon.com – they are located in Tualatin. The second one has some gorgeous designs but they are located out in Bend – http://www.wallbedfactory.com Check those out! I hope you find something that meets your needs! I lived in a tiny studio apartment with a murphy bed for 4 years and it was the best thing ever to be able to have that open space during the day to use how I liked – yoga, a party with friends, etc., but at night it felt like a different room even though it wasn’t. It was like a separate bedroom. Hi Stephanie. Thanks for sharing your own experience with a murphy bed! I think they are so cool! Thx for visiting and leaving your comment.